It took 14 months. But shares of Facebook topped their initial public offering price of $38 again at long last. 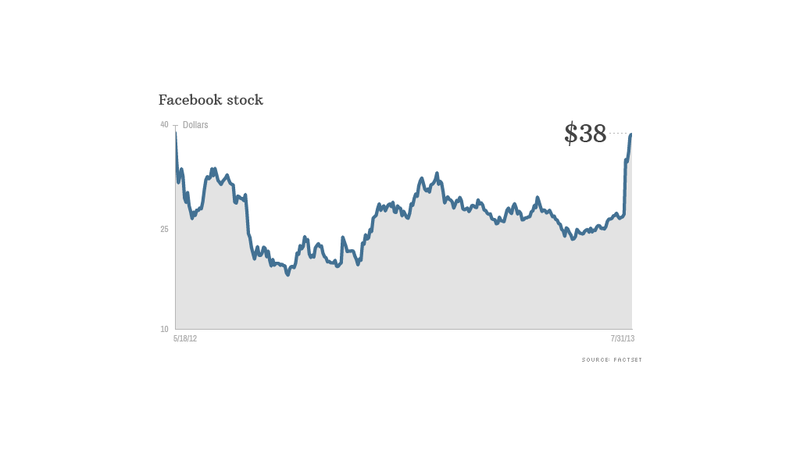 Facebook shares rose above $38 a share Wednesday for the first time since the social network went public in May 2012. But the early gains didn't hold, and Facebook ended the day down nearly 2.2% at 36.80 a share. The stock has clawed back from steep losses over the past year. It fell as low as $17.55 in September. But Facebook has been on a roll ever since the company blew past earnings estimates last week. Shares have gained nearly 43% in the past five days alone. In particular, investors have been impressed by Facebook's significant improvement in its mobile business. The number of people using Facebook on mobile devices surged by 51% in the latest quarter, to 819 million. And mobile ad sales accounted for 41% of Facebook's total ad revenue. Mobile had been Facebook's biggest challenge. The breakthrough in mobile unleashed a wave of positive research reports from Wall Street analysts. More recently, the rally has been driven by speculation that Facebook will introduce TV-style advertising. The social network is reportedly planning to charge up to $2.5 million a day for such ads, which would potentially reach Facebook's more than 1 billion users. "They figured out mobile, and it works," said David Lamond, chief investment officer at Lamond Capital Partners in San Francisco, which owns about 475,000 shares of Facebook. "They still have more work to do -- the video ads haven't started yet -- but we think this is at least a $50 stock." Lamond said his firm began buying Facebook earlier this year. He said the stock will "probably take a breather here," but will head higher over the long run as Facebook monetizes other assets, such as photo sharing service Instagram. "The bottom line is that advertising on Facebook works," he said. "There was a lot of skepticism about that when they first went public." Analysts have raised their earnings forecasts substantially in the wake of the company's strong results. Wall Street is now expecting that Facebook will earn 71 cents per share, up from a consensus estimate of 57 cents per share before the latest results came out last week. But Facebook shares are still expensive. The stock trades at about 40 times 2014 earnings expectations, compared with roughly 15 for the S&P 500, according to FactSet. The stock could remain volatile since expectations are now high for the company, especially in mobile. On Tuesday, Facebook unveiled a new platform for mobile game developers. Mobile Games Publishing is aimed at helping developers create mobile games that Facebook would promote. Social media stocks in general have been hot this year. Shares of LinkedIn (LNKD), which has been described as a Facebook for business professionals, are up nearly 80% this year. Social review sites Yelp (YELP) and Angie's List (ANGI) have also soared. Even beleaguered daily deals site Groupon (GRPN) has surged this year following the departure of its controversial CEO Andrew Mason earlier this year. But while Facebook and many other social media stocks are enjoying a rebound, another firm that once had close ties to Facebook isn't faring quite as well. Zynga, the maker of FarmVille and other games, has fallen out of favor with users and investors. Shares of Zynga (ZNGA) are trading below $3 a share, down from an IPO price of $10. -- CNNMoney's Katie Lobosco, Catherine Tymkiw and Julianne Pepitone contributed to this report.